SS Tycoon: New Year Angel Tyche Arrives! [Patch Notes] SS Tycoon: New Year Angel Tyche Arrives! Angel Tyche is born during the Lunar Spring Festival. She loves red color, fireworks, firecrackers and all things that celebrate Lunar New Year. She is very happy to arrive in Angel's Land and fight with warriors. 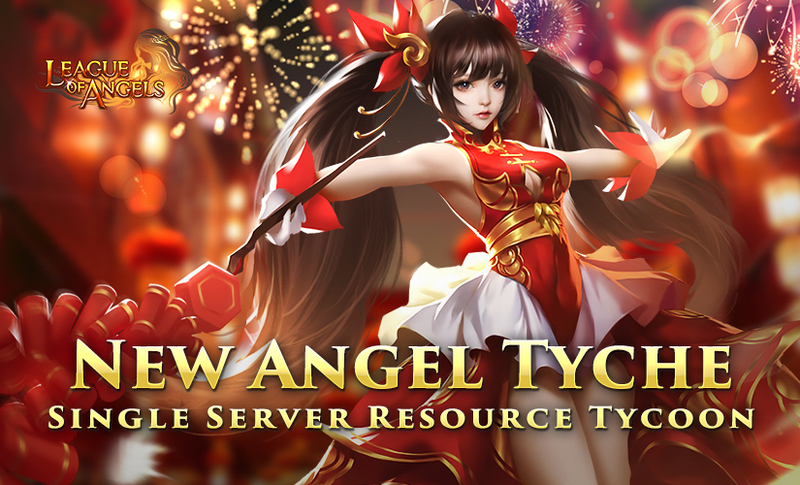 New angle Tyche will make her debut inSingle-server Resource Tycoon fromJan. 10th to Jan. 15th. Let's know more about this angel. Tyche is born with great magic power, whose skill is called “Divine Blessing”, by which she will deal enormous magic damage to all enemies and increase all party’s ATK, Crit and Agility with a 100% chance of hitting, lasts 3 turns! Hurry up to invite Tyche into you squad, and she will bring you the power of Divine Blessing. From Jan 10th to Jan 15th (server time), you can gain points by collecting required resources during the event, i.e.Gold, Angel Tears, Gem, Blessed Stone, Energy Vitamin, Gem Enhancement Stone,Enchanted Ore, Spirit Essence, Magic Mount Soul, Odd Fruit, Beast Crystal,Godsend, Flaring Heart, Spring of Crystal, Spring of Dreams. Please note that the above content might be adjusted due to changes of the development plan. Final updates will be determined in game. More exciting events are coming up through Jan 10 to Jan 15 (server time), check them out in the in-game Hot Events menu now! Last edited by Sidhe; 01-09-2019, 05:01 AM.